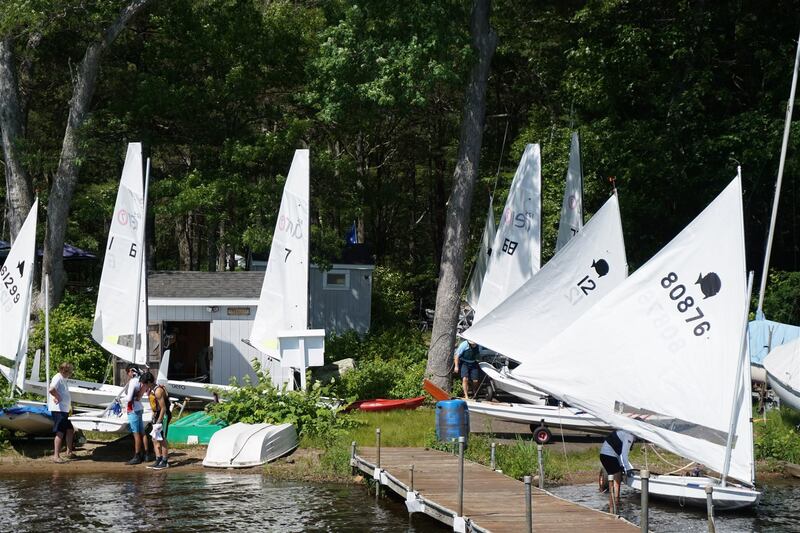 The Sharon High sailing team has concluded the season as Massachusetts’s best public high school sailing team in NESSA (New England School Sailing Association) team racing, NESSA fleet racing, and the State Championship Regatta. In the fall fleet race season, the team raced in regattas in Portland, ME, Martha’s Vineyard, and at an intersectional regatta at the Coast Guard Academy in Connecticut. The team qualified for the Atlantic Coast Championship in Rochester, NY, where they finished fourteenth among teams coming from the Virgin Islands to Minnesota. The Sharon team is a member of the Mass Bay League, composed of 32 teams surrounding Boston inside the Route 495 beltway. 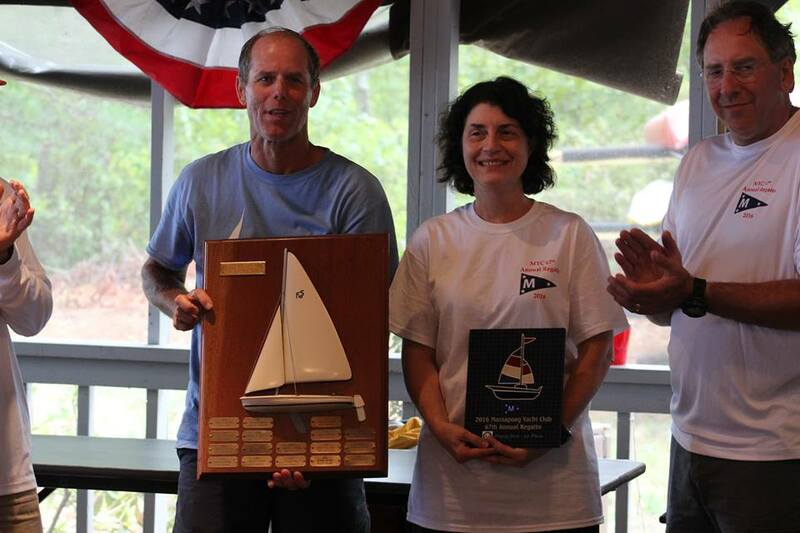 Sharon finished first in the team race season at 9-0, and first again at the league’s fleet race championship regatta which involves four large fleets and about 100 sailors. Sharon is also a member of the regional New England Schools Sailing Association where they compete against some 80 teams from the New England states, including the elite private schools who founded sailing as a high school sport and who draw students with national championship and Olympic aspirations. In the New England Fleet Race Championship, Sharon finished seventh, the highest finish of any public school in Massachusetts. That earned a berth in the Phebe King regatta in Annapolis where they finished ninth among 18 teams from the Mid-Atlantic to the Midwest and even one team from California. In New England team racing, the team was ranked ninth, again the highest finish of any Massachusetts public school. That earned a berth to the Terkelson Invitational Tournament in Portland, Maine, where Sharon finished second. The season was capped off with a second place finish at “States,” beaten only by the private school team that placed third at the nationals. Once again, this was the highest finish by any public school in Massachusetts. The team includes several current or former MYC members: head coach, Gary Werden, assistant coach, Lisa Downey, and sailors Jack Eberhardt, Meghan Haviland, Aaron Fairchild, and Arthur Rabinowich. 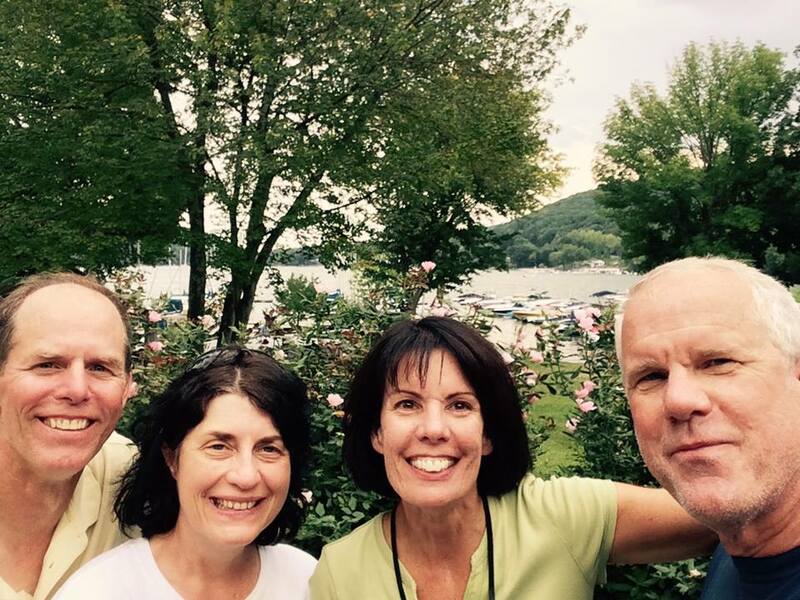 We had another wonderful time at the 67th Annual Massapoag Yacht Club Regatta, with 57 boats participating. 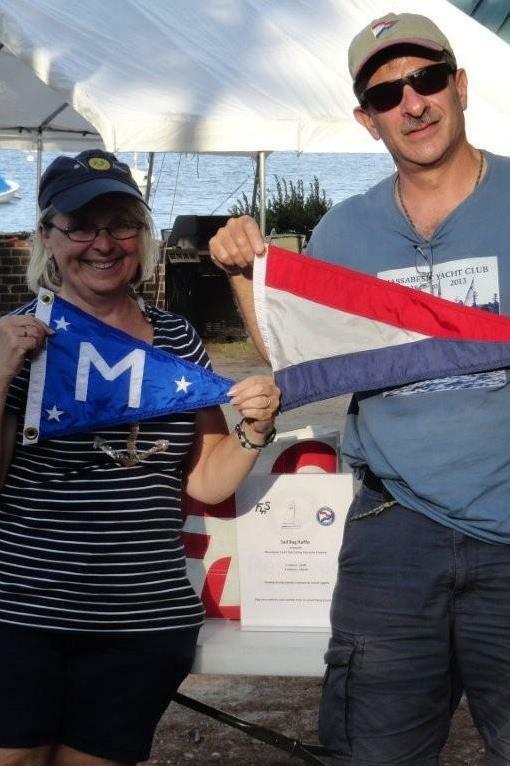 There were 16 Flying Scots - winners John and Connie Eckart (pictured here), 6 Day Sailers - winners Mike McCaffrey and Suzanne Boohar, 4 Comets - winners Talbott and Carol Lee Ingram, 9 RS Aeros - winner Marc Jacobi, and 22 Sunfish - winner Andy David! What an amazing sight on the water ! The PRO Gary Werden and crew did a good job of keeping fleets separated using Trapezoid courses. The finish boat had quite a task keeping all the finishes straight but we got everyone scored and got the results up pretty quickly.The food from Roche Brothers was excellent as always and we enjoyed some nice meals, including lobstahs with friends and lots of stories to tell. We unfortunately had a squall on Sunday that blew across the lake and capsized 10-15 boats. Many self-righted and the rest were taken care of by MYC rescue boats, other sailboats and MYC members going out in dinghies to boats near the dock. One boat even caught a fish when it was righted and we all had a good laugh at that one! No injuries were reported but a few boats will need some new parts. The Sharon Police and Fire Departments checked in to make sure everyone was safe and we were able to report that everyone was accounted for. Talk about a story to remember! Thanks to all who participated and everyone who worked the regatta. Hope you all had a great time!Full results can be foundhere. Matt Lally hosted thee August 20, 2016, Moonlight Sail at MYC on a beautiful night with the moon coming up as 5 boats plus the committee boat made their way out to enjoy the night. The boats were lit up with mini-lights and looked magical as they sailed around in the moonlight. I am told by many participants and spectators that Massapoag Yacht Club and Fleet 76 rocked it from registration and measuring on Saturday and Sunday, to the catered meals from Blue Rocks Market in Newport, the make your own PB&J sandwiches, liquid refreshments, launching and retrieving boats, trophy presentations, and all the way through the juggling of boats and cars at the end of the day on Thursday. We had some help from other New England and the Candlewood, CT, fleets in registration and measurement and that went very smoothly thanks to some very organized and patient Fleet 76 members. With 46 boats and suits of sails to juggle at registration and measurement and then on the water, this was no easy task. Photo at left - MYC's John Eckart and Roger Sharp are awarded their 5th place trophy in the Championship Division. Two Flying Scot teams from MYC traveled to Panama City, FL, for the Midwinter Championship at St.Andrews Bay Yacht Club.The weather was fabulous, the hospitality was super, and the racing was great too with 40 boats participating,Son/Father Team Zeke and Jay Horowitz won the Championship Division, Son/Father Team Andy and Doug Fox won the Challenger Division and lots of other family teams were participating!John Eckart and Roger Sharp were 5th and Greg & Diane Kampf were 17th.We could not have asked for a better week! The Eckarts and Sharps were 2nd and 3rd respectively at the Roger Punzi Memorial/Greater NY Districts on August 29-20, 2015. Brian Hayes and his son won the regatta in light, shifty, ever changing winds. Weather was perfect both days - minus the wind. Details are on fssa.com. 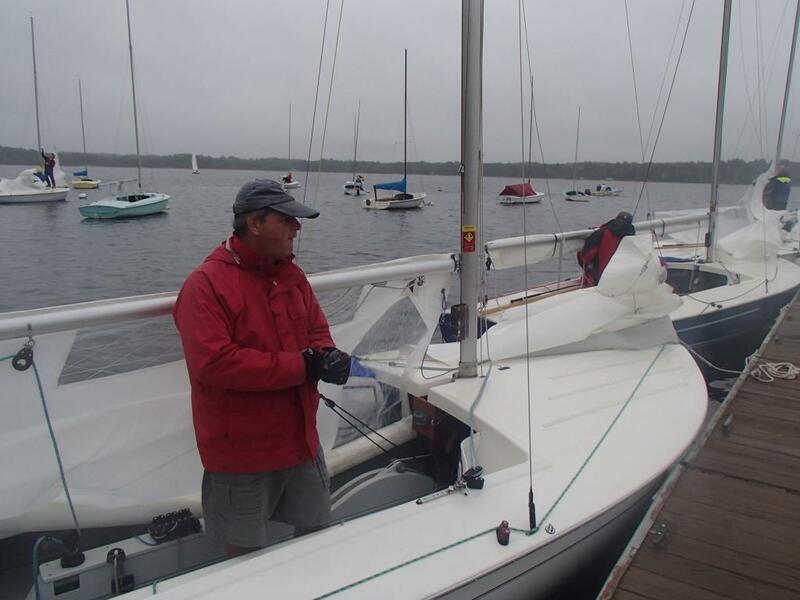 Massabesic Yacht Club in Manchester, NH, hosted their first New England Districts with 15 boats from 4 New England fleets - Massabesic, Massapoag, Quannapowitt and Rockport. After a forecast of thunderstorms threatened to put a damper on things, the weather and winds cooperated fully with temps in 70's and south/southeast winds from 6-10 and occasionally higher. We had 5 races, a combination of Olympics and W-L with the last race coming just in time before the deadline of 3:30. We all had a great time. Shore side hospitality was great and we thank Dennis Dobe and crew for a great regatta. Roger and Laura Sharp won the event, John and Connie Eckart were 2nd and Greg and Diane Kampf were 5th.